Well, today I won an Internet auction, and became the owner of a Swedish P 1857 percussion cap pistol. 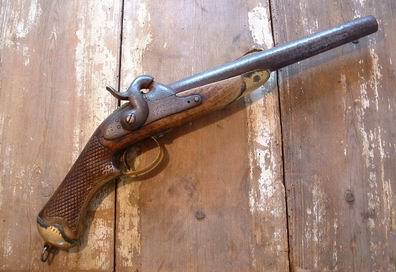 I'm planning to try blackpowder shooting, and this is by all reports an affordable weapon which shoots well. In a country with quite a few laws concerning gun ownership, the nice thing is that an antique gun like this doesn't need a permit. I just need to ask the Police for a permit to store gunpowder in my home, which is a breeze. Any other blackpowder shooters here? No, not blackpower - but i would love to have one! It´s true that we have fairly strict gunlaws ower here - i hold on into my licences like my life depended on it. I wish you good shooting. Yup , nothing like that ... *BOOM* , and smell , of blackpowder ! I've got a flintlock Virginia long rifle, in .50 cal. , by Jack Garner, and an all steel Scottish flintlock pistol in .52 cal., by Dixie Gun ! Interesting stock on that pistol, Björn. Don't think I've seen one that fills in behind the triggerguard like that on pistols of that period before. I own a flintlock longrifle similar to Macs, although mine's a cheaper Pedersoli model. I've also had a lot of experience with cap and ball revolvers. Another peculiarity is that there's a slotted brass plate on the back of the grip, intended for a shoulder stock like a Mauser "broomhandle". The pistol isn't the prettiest (I'm more partial to 18th C flintlocks), but it's a beginning. Posted: Sun 28 Sep, 2003 7:16 am Post subject: Oh NO!!! Are you going to try and win a banjo on ebay too? Find me on Facebook, or check out my blog. Contact me at eric@crownforge.net or ericmycue374@comcast.net if you want to talk about a commission or discuss an available piece. Posted: Sun 28 Sep, 2003 10:21 am Post subject: Re: Oh NO!!! Right after I've married my cousin! Actually, blackpowder shooting is gaining ground here in Sweden, many using vintage revolvers and such. I saw a few pistols today of the same type as the one you have Björn, one of wich had the shoulder stock attached. They had some swords too of course, mostly military sabers. I own two muzzle loaders as well, but for me it was more of a "get two more weeks of the best part of the hunting season" than anyting else. I'm impressed with what a heavy .45 cal saboted slug in a .50 cal rifle moving at 1400+ fps will do. Darn near split a small tree in half when I cleared my gun after a day in the field. Even using black powder substitutes like Pyrodex, cleaning them is a lot different than centerfire arms. I'm partial to dish soap and scalding hot water for black powder, vs. petrolium based cleaners for modern arms. Smiling...all hail the holy black? "Neither flesh, nor fowl, nor good red-herring..."
I been shooting matchlocks for several years now, but just finally got around to buying one a few months ago. Mostly I shoot in English Civil War reenactment, with no ball, but shooting lead from blackpowder is ALOT of fun! Welcome to the crowd, Björn! Black powder is a blast! Ohh sweet! I need a mop, much drool! Posted: Thu 23 Oct, 2003 1:54 pm Post subject: Hurrah for powdersmoke! I've been shooting black-powder firearms for just over a decade now. I hope you love it as much as I do Bjorn! Pity about the gun. It looks gorgeous.